The annual tub of free ice cream deals for National Ice Cream Day have already come and gone this year, but thanks to a new promotion from Baskin-Robbins, you can get your hands on a free scoop right now. We recommend eating it from a bowl, though. 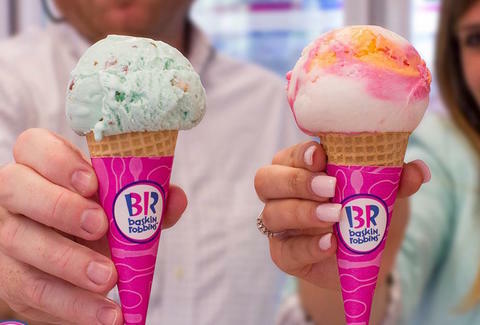 In celebration of Baskin-Robbins' new mobile app, the scoop shop chain will give you a free 4oz scoop of your favorite flavor, when you download the app and create an account, according to a press release. Once you've signed up, a coupon for a free regular scoop will appear in the app's Deals section. The fine print says it's valid through October 2nd, meaning you'll have plenty of time to decide on whether to go with a classic flavor like Gold Medal Ribbon or change things up with the new, crazy-sounding OREO Milk ‘n Cereal flavor. The app also includes coupons for additional discounts like a $1.99 single-scoop warm cookie ice cream sandwich, among other features. Of course, getting the free ice cream requires downloading an app and signing up for an account, but it's a small price to pay for free ice cream. Tony Merevick is Cities News Editor at Thrillist and hasn't eaten nearly enough ice cream this summer. Send news tips to news@thrillist.com and follow him on Twitter @tonymerevick.